I don’t consider myself a very picky eater, but there are a few foods that make me cringe. Miracle Whip. Sweet baked beans. Greasy salami. Thousand Island Dressing. Walnuts. It’s true: walnuts are the least tempting of any nut, in my book. They were always the disappointment at the bottom of my Christmas stocking, the annoying chunk of sour crunch in my otherwise gooey brownie, the waxy and bitter thing that looked more like an insect than an edible. So why on earth would I make a dessert out of walnuts? Well, someone I work with brought me a whole pound of shelled walnuts recently. “I know you like to bake,” she said, “and I was near an orchard in Northern California.” I was so touched that I forgot my feelings for walnuts as I gratefully accepted the sweet gift. I wasn’t sure what I’d do with them, but I trusted I could turn them into something tasty. By toasting them until they smelled like baking bread, grinding them into a flour-like meal, and pairing them with orange zest and sweet pears, I became transformed just as the nuts did. Walnuts can be delicious. I can hardly believe my words, but they’re true. Preheat oven to 350 F. Spread walnuts on a baking sheet and toast in oven 15 minutes, until very fragrant. While walnuts toast, lightly grease the inside walls of the springform pan. Cut a circle of parchment paper to fit in the bottom of the pan (tracing it first can be easiest). Place parchment in bottom of pan, then whisk together 1 tablespoon sugar, the oil and the liqueur in a bowl, spreading it onto the parchment. Peel pears and slice in half, removing stems, seeds and veins. 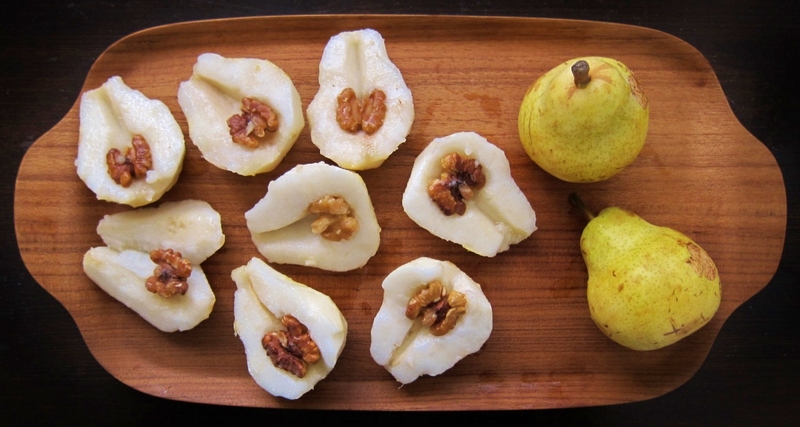 After nuts are toasted, place one walnut half in each of the pear’s cut-out centers. 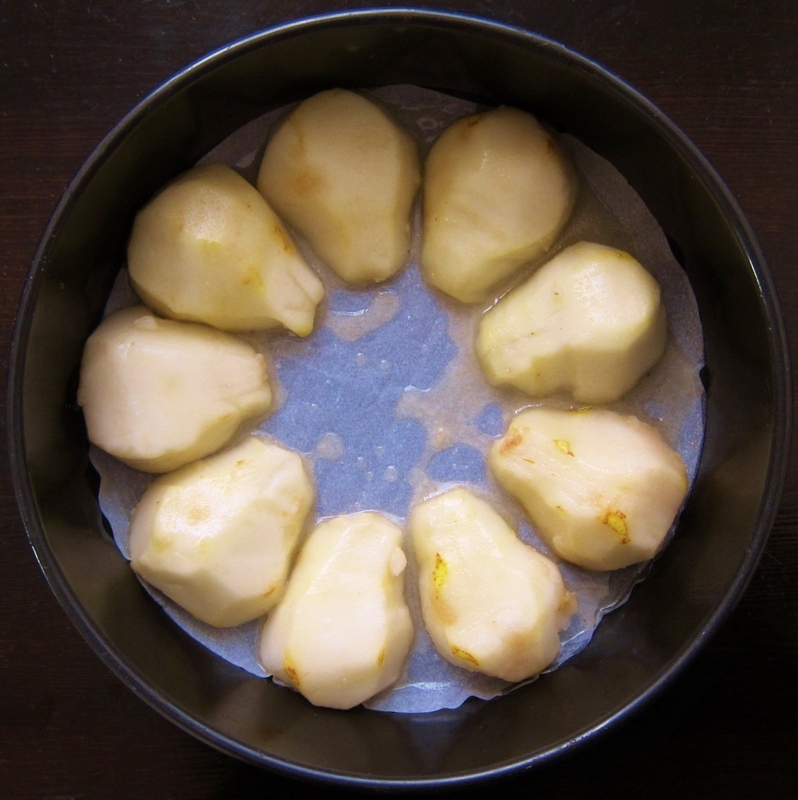 Place the nut-stuffed pears sliced-side-down into the pan, narrow ends toward the center. (Depending on the size of the pears, it’s possible that not all halves will fit into pan.) Leave the oven on at 350 F, or turn off and re-preheat before beating egg whites. 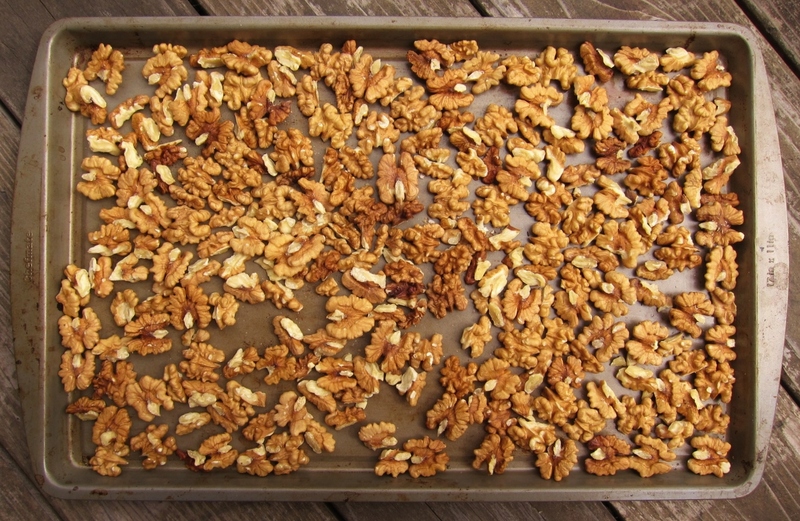 Once the walnuts are completely cool, if they have a lot of peels (which can make them taste bitter), rub them between your hands with a clean dishcloth to loosen and remove most of the peels. (This can make a mess; I like to do it outside when possible.) 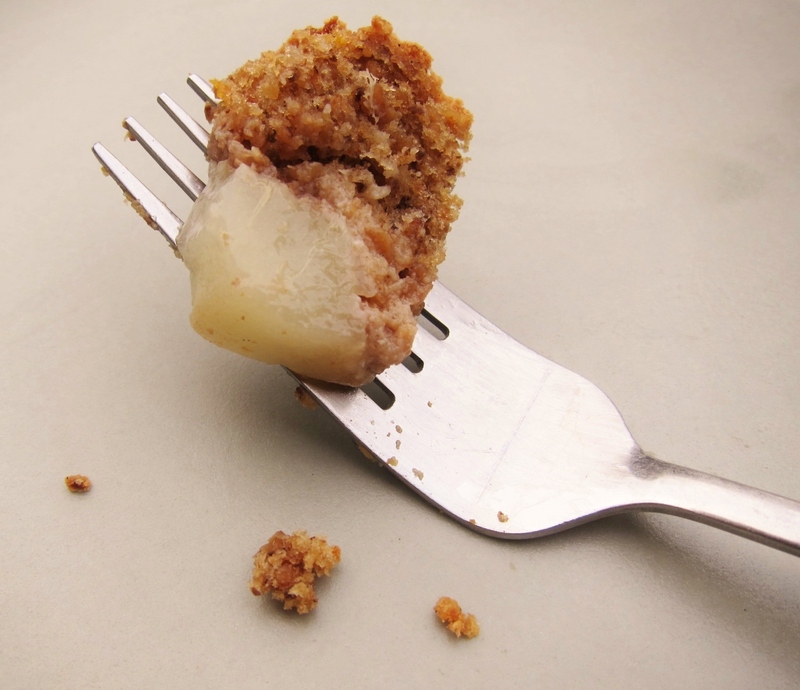 Discard the loosened peels; some will have stayed stuck to walnuts’ crevices, which is fine. In a large bowl, beat the egg yolks well with 1/3 cup of the sugar, mixing until pale and smooth, then add both vanillas and blend. Fold in the nut/flour mixture and the orange zest. Mixture will be very thick. In a separate bowl (preferably the bowl of a standing mixer), beat the egg whites on high until they begin to become foamy and white.Keep mixer going and slowly add the remaining 1/3 cup sugar. Stop mixing once the whites are thick, shiny and stiff. 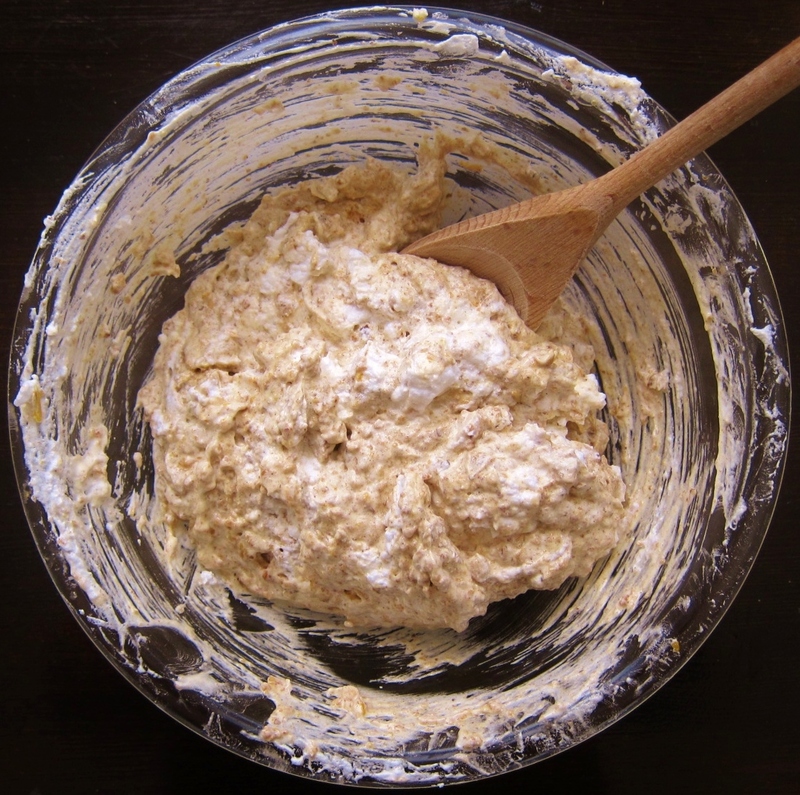 Scoop out about 1 cup egg whites, and mix it into the nut batter to loosen and moisten its texture. Then very gently fold in the remaining egg whites, slowly folding until the ingredients are equally distributed and a fluffy batter has formed — this can take a few minutes. Finally, spread the batter evenly over the pears. Bake for about 45-50 minutes, until top of torte is toasted and does not deflate when pushed, and a toothpick inserted in its center comes out batter-free. Let torte cool completely before unlocking sides of pan and inverting it onto a plate. The torte is best served just after it’s cooled and been inverted. Eat within a day, storing in fridge if not serving within a few hours. Speckled with vanilla beans and orange zest, this dessert sings with buttery nuttiness (without any actual butter). Its generous wedges of juicy, soft pear add a sweet and delicate flavor, while the high ratio of walnut meal offers a richness I never knew I loved until now. Surprisingly light for being nut-based, here is a treat that’s wondrously fragrant and bright-tasting. I can assure you that this moist, flavorful torte will make walnut lovers swoon, while walnut loathers just might be transformed. I know I am. Maybe next time… This torte would be even more delicious served with ice cream or a drizzle of Grand Marnier custard like the one I made here. I’m glad I tried it with walnuts, but I do think it would work well with almost any nut in their place (almonds or hazelnuts come to mind first). 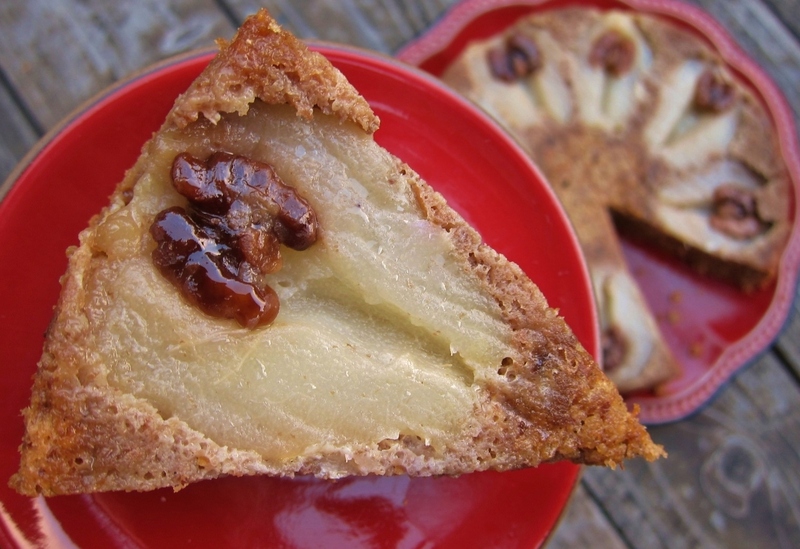 Finally, this wholesome pear walnut torte makes as wonderful a breakfast with coffee as it does a delicious dessert. If you’re wondering what makes a torte a torte, this is a debatable issue. In a reliable baking reference book recently, I found that the index’s entry for “torte” simply stated the following: “See cake.” Indeed, torte is the word for cake in some languages. From my own research, torte recipes are much less reliant on traditional flour than cakes are, and they are rarely frosted. In my opinion, the dessert I made here was simply not enough like a cake or a pie to call it one. This entry was posted in Pies, Tarts, Tortes & Cheesecakes, Sweets, Traditional with a Twist and tagged baking, breakfast, citrus, dairy-free, dessert, nuts, orange, recipe, torte, vanilla, vanilla bean, walnuts. Bookmark the permalink. Oh, how inspired and absolutely gorgeous! I admire your creativity in coming up with a way to make these delicious! It has me thinking about how to get creative with my most cringe-worthy foods…mayonnaise, raw onions, canned green beans…I think walnuts have a much better outcome here than any of those things ever will! Bravo! 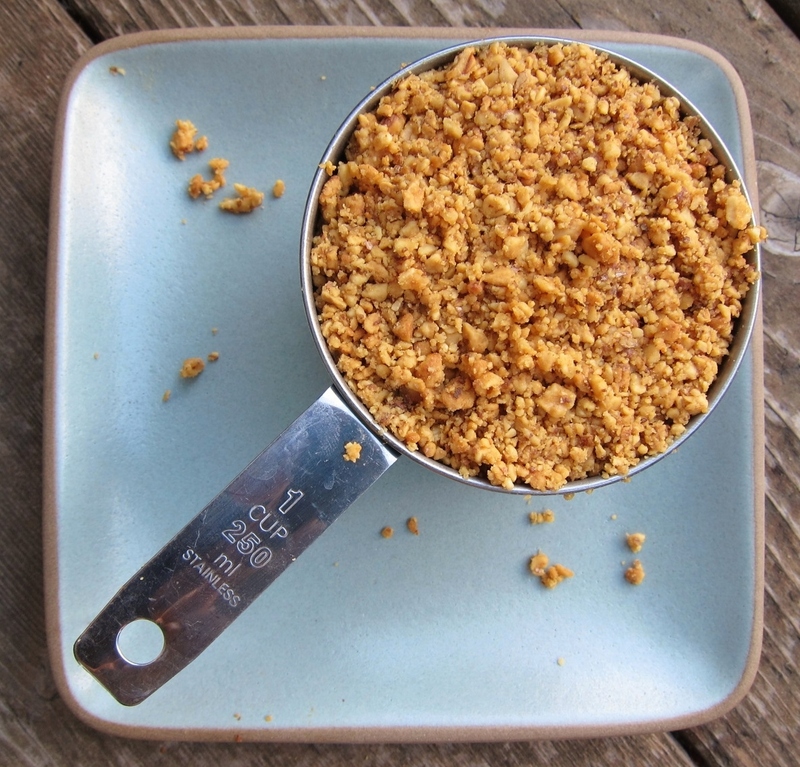 Yet another wonderful recipe from the Butter Sugar Flowers kitchen. It looks delicious! 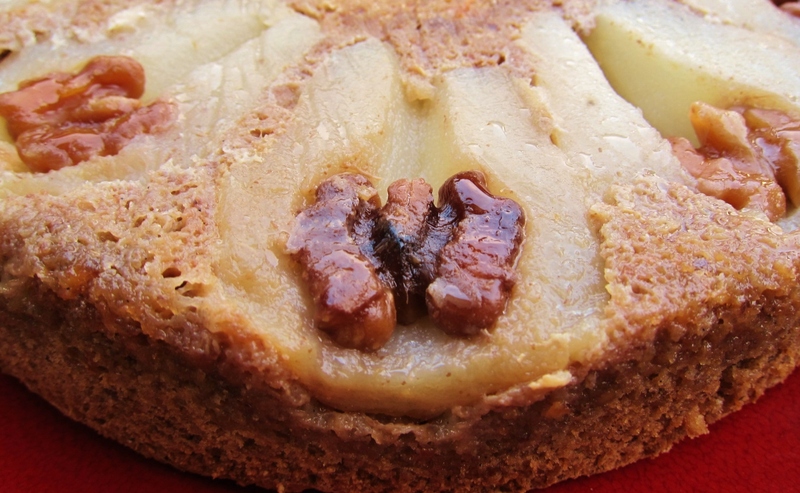 As a lover of walnuts, this cake sounds like my kind of dessert! It’s as beautiful and creative as all the other desserts that come out of your kitchen, and I’m glad you found a way to enjoy walnuts! You know, when I went to that Persian cooking class back in May, the teacher mentioned that Persians pour boiling water over walnuts and then salt it heavily to take away the naturally bitter taste of the walnut. Maybe this tip will inspire you to continue enjoying walnuts; I certainly hope so! Thank you, Katy – for you kind words and for the tip about walnuts. I’m excited for you to stop by! It’s actually been really busy for me, but coming home and baking keeps me sane! I am so glad to have found your site. I commented at Berkeleyside on your lemonade cake, which was out of this world. 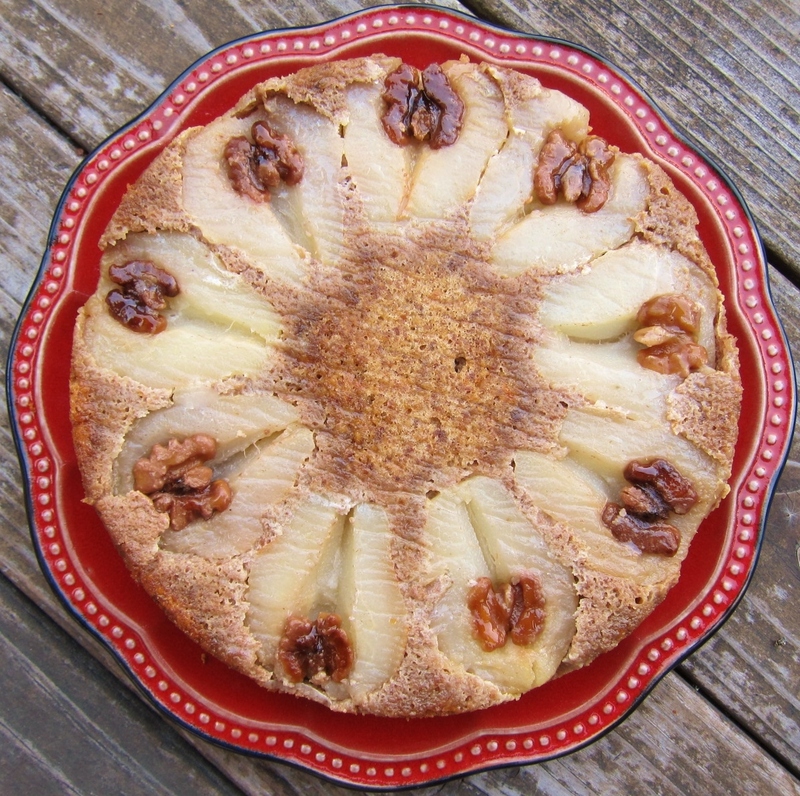 Now this pear walnut torte has me even more excited to hit the baking. Thank you for such fabulous inspiration! I can’t wait to make this recipe. I’m so glad you understand about Christmas!� ; )� Thanks for your kind words — I was thinking the same thing about your recent plum cake.� Here’s to our creativity in the kitchen and beyond! I’ve been sitting and enjoying every detail of this recipe this morning! It seems like an easy one to do gluten free, so I’m really excited to try it! The pictures are amazingly beautiful and make me feel like I’ve been transported to another country to learn how to make the perfect torte from a master. Thank you! Thank you so much, Hannelore!� Your kind words brighten my day.� I wish we could make this together, or at least eat it together!